The ladies with their heads covered ask me where I am from. I ask them the same question. They say “Iran”. I exclaim: “How come you cross the Georgian border to go to Iran when there is a Turkish-Iranian one!” The lady who had started the small talk said shortly: “We are travelling” and ceased the conversation ashamed for my inanity or not willing to talk to such a blockhead. I was probably thinking that if a lady had her head covered she may only be crossing the border as part of a transaction – being swapped for a camel or such. Having set our feet and wheels on the Georgian soil, we went to the place we still could not pronounce after training and trying for something like half an hour – Achalkalaki. 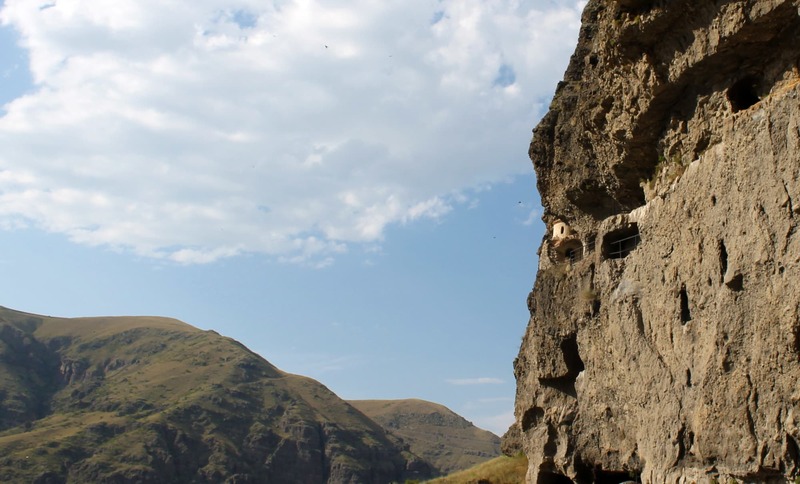 Having done our grocery shopping (Georgian vine, smelly cheese and khachapuri bread) we set out on the road towards Vardzia – an ancient cave town. The endless serpentine route to the Valley of Mktrvi River (where Vardzia was situated) was incredibly scenic, but it took us ages to get down. When we finally reached the valley the lively tunes from a restaurant by the river drew our attention – its visitors were simply making music and singing. I tried to substitute the Georgians with Germans in my imagination and quickly gave up. Along the river, there are some good swimming spots, spots for camping (not really hidden or private though), some ruins of fortresses and ancient monasteries. There was also a well preserved one – Sapara Monastery – a 12th-century church with old frescoes. In the evening we strolled through the green hills of Mktrvi River Valley accompanied by the cows who were returning home on their own. it took me some time before I saw a monastery on the picture. I was looking to the left 🙂 How can you go up there? There is a small staircase leading up to the church. It is hidden rather well.